I know the Man of Steel is a character lots of people are ambivalent towards. Truth be told, Superman comics have always been hit-or-miss with me. There are just so few writers who can find the right balance between Superman’s powers and his enemies without going overboard with apocalyptic crisis after apocalyptic crisis or settling for ridiculous villains to test him. But, in this collection, I thought George Perez did a decent job finding and maintaining that correct balance. Since this is The New 52 Volume 1 (Yeah, I’ve come late to the party. And, yes, I have heard it’s ending soon. ), I expected lots of backstory. Thankfully, Perez skipped all of that, throwing me directly into the action, and filling in the past with brief flashbacks. All of which worked perfectly for me. As for the plot, it is basically random attacks on Metropolis by elemental creatures. These beings appear to be alien in origin but might actually be speaking Kryptonian! Naturally, Superman has to fight off these ever escalating disruptions of metropolitan life; all the while being captured in action by hordes of news reporters – both type and television. Lots of fighting ensues. Some of it is exciting, while some of it becomes a bit repetitive. However, interspersed between these mandatory fisticuffs are more than a few scenes about the interesting stuff: Clark Kent’s life. Yeah, I did say Clark Kent was the interesting part of this collection. And I actually meant it too. Now, before I explain, I have to admit it: I like Clark Kent. The guy is so damn nice. How could you not like him? I mean, he has god-like powers, but he has decided that he wants to help those weaker than himself instead of lording over them. He does this not only by being Superman but also by the types of causes he champions in his normal job. And even when people look down on him or portray him as weird or weak, the guy has the intestinal fortitude to control his anger and keep walking the path his conscious tells him he should. Sure, he isn’t messed up in a cool, dangerous way like other superheroes, but for me that is what actually makes him uniquely interesting. So, anyway, I went into this read already liking Clark, and Perez’s deft handling of Clark’s personal challenges pulled me in. First, I loved the whole “nice guys finish last” aspect of the story. Clark is a nice guy. He tries to live by the morals and ethics he has chosen for himself. Unfortunately, not everyone else abides by those same values. Thus, Clark doesn’t get ahead perhaps as much as his more driven, less scrupulous counterparts. 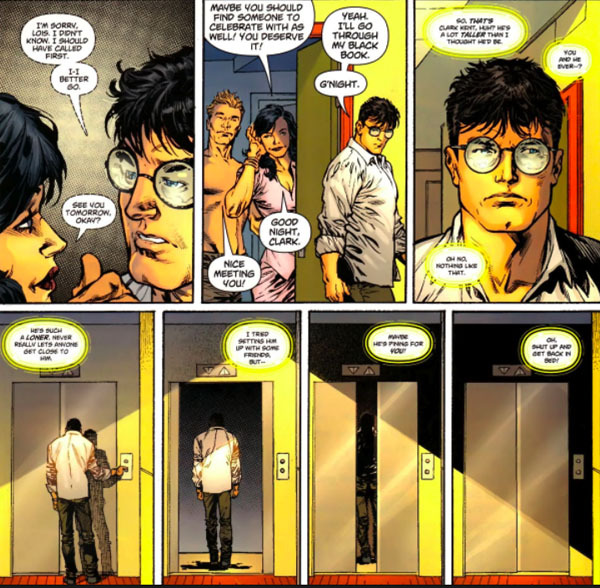 Maybe, even his infatuation for Lois Lane is doomed for failure, because he acts too much like a modern gentleman. And the interesting part is seeing how Clark handles all this when he knows that he is Superman and that revealing this fact could improve his life on so many levels. The other thing I loved was how Perez handled Clark trying to keep his identity secret in a modern world with zero privacy. I mean, it is something I’ve thought about for decades now. Sure, fifty years ago I could see Superman jumping in a phone booth and being able to escape notice, but in the Twenty-first Century, it doesn’t seem practical. And here the creative team actually addresses that issue more realistically. We see G.P.S. tracking; the pinging of Clark’s location via his cellphone connection; video (surveillance and cellphone) capturing Supes travels; and the instantaneous accessing of all this by computer. While Perez didn’t resolve it completely, I really like how he tried to handle that aspect of the Superman mythos. Now, I always try to mention artwork in my reviews, because without them this wouldn’t be a comic, right? So if you were wondering, the art in this collection is first class, as you’d expect it to be if Perez is even slightly involved in it. Overall, the New 52 Superman Volume 1 was an enjoyable read. It didn’t make me leap over a tall building in excitement, but it did make me want to read the next volume. Who knows I might even have caught up on all the New 52 Superman action by the time the next reboot happens in a few months. 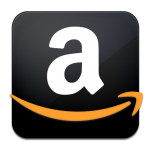 Purchase the collection at Amazon. 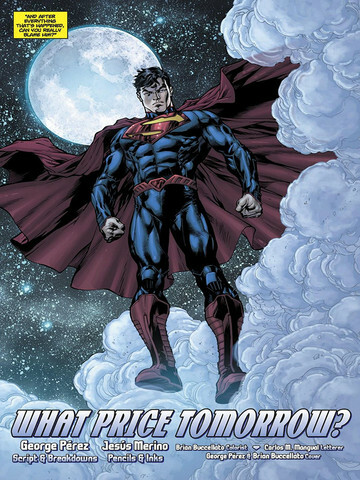 This entry was posted in 3 Stars, DC, Graphic Novels, Superman, The New 52 and tagged Clark Kent, George PErez, graphic novels, Superman, The New 52, The New 52 Superman, What Price Tomorrow. Bookmark the permalink. 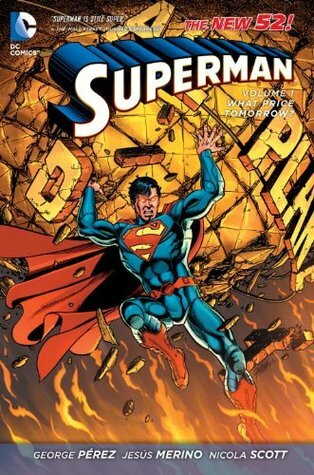 If you liked this one, Superman: Unchained by Geoff Johns & Jim Lee might appeal to you… Great comic.